IGOR Pro 6.0 のディスク | Shizuka's Diary Page. Igor Pro 6 runs on Mac OS X 10.3.9 or later. Igor Pro 6 runs natively on both PowerPC and Intel-based Macintoshes. 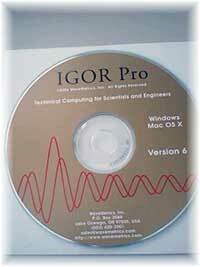 Igor Pro 6 runs under Windows 2000, Windows XP, and Windows Vista. Igor Pro 6 does not run on Windows NT, Windows 95, Windows 98 or Windows ME.